The transmission line issue happened at 2:59 p.m. and power was back on 30 minutes later, according to an Oncor manager. 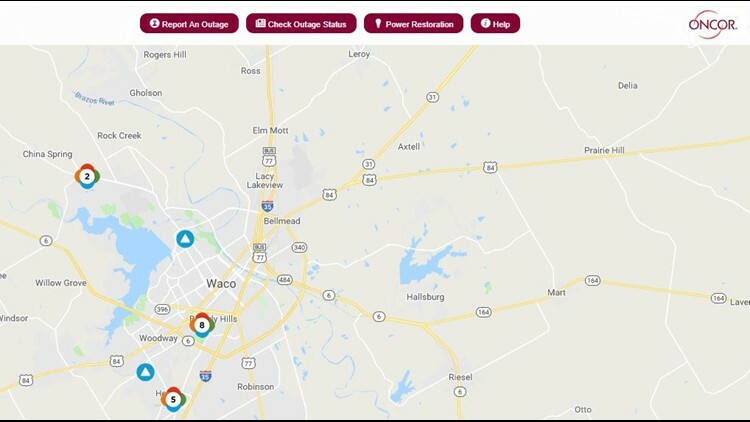 WACO, Texas — More than 18,000 Oncor customers were without power around 3 p.m. on Monday, according to Oncor's outage map. Oncor South Region Manager Michael Baldwin said a transmission line issue happened at 2:59 p.m., causing 7,702 customers to lose power. Baldwin said power was restored at 3:29 p.m. The outage happened around Highway 6 in Waco, and parts of Woodway and Robinson were affected as well. Oncor crews are patrolling the line, according to Baldwin. Around 4 p.m., the map said about 50 customers were still without power. The cause of the outage was not listed on Oncor's website. Baldwin said crews are working to figure out what caused the transmission line issue.